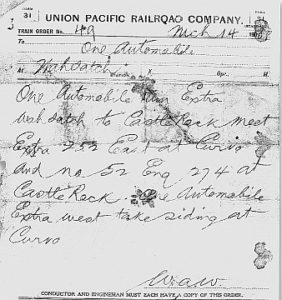 When the trails ran out, the Flyer was forced to take to the rail bed of the Union Pacific. The Thomas was designated a “special train” with the Flyer becoming Engine #274 complete with a conductor riding in the back seat. Without stone ballast between the ties, tires were often shredded by the spikes holding the ties. Delayed while repairing the tires, the Flyer was nearly crushed by a speeding westbound Union Pacific Express Train! Complete desolation, hot, parched, beautiful, huge expanse, did I say HOT? All words to describe aptly named “Death Valley”… It’s hard to imagine the Flyer making it through here with no roads? We started out at 5AM from Tonopah with the simple strategy of making it into Death Valley (-279 feet below sea level) and out before the sun baked it to over 100*. I remember Great Gramp telling that he bought a pail of water here for 50 cents ($12.50 current value) on March 22, 1908. There was a tent, water well and not much else at Stove Pipe Wells back then. Today there is the General Store and almost more important than water, a gas pump! 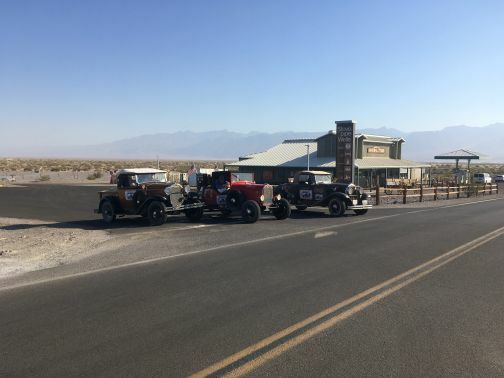 With the Model A’s 10 gallon gas tank coming from Tonopah, the nearest gas is 115 miles away. Gas was over $4 per gallon, but there were no complaints….